Home » video » How to Convert MPEG-2 to MOV and Play MPEG-2 in QuickTime? How to Convert MPEG-2 to MOV and Play MPEG-2 in QuickTime? 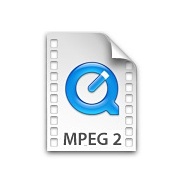 This article will introduce two solutions to successfully play MPEG-2 in QuickTime. MPEG-2 is widely used as the format of movies that are distributed on DVD/Mini DVD and similar discs. Generally, the videos/movies on our daily DVD, Mini DVD camcorders, are MPEG-2 format with the filename extension .mpg and are played on DVD players or Mini DVD players. Another apply of MPEG-2 is that it is the format of digital television signals that are broadcast by terrestrial (over-the-air), cable, and direct broadcast satellite TV systems. In this case, TV stations, TV receivers and other equipment are often designed to this standard. Ever thought to play back MPEG-2 content, including both multiplexed (a.k.a. muxed, where the audio and video tracks are interleaved into one track) and nonmultiplexed (a.k.a. elementary) streams in QuickTime? Maybe you will say QuickTime only supports for MOV, MPEG-4, and QT. Yes, it is. But, there still other solutions to play MPEG-2 content in QuickTime. Install QuickTime MPEG-2 Playback Component, then you can successfully import and play MPEG-2 in QuickTime or QuickTime Pro, including both multiplexed (also known as muxed, where the audio and video tracks are interleaved together into one track) and non-multiplexed (also known as elementary) streams. This solution needs you pay $19.99. And the official site where you can buy QuickTime MPEG-2 Playback Component is that: For Mac Version, For Windows Version. The QuickTime MPEG-2 Playback Component is only compatible with QuickTime 6 and 7, and it will work with or without QuickTime Pro. You cannot perform editing functions such as Cut, Copy, Paste, Add, and Add Scaled with MPEG-2 media using QuickTime Player or QuickTime Pro even if you have installed QuickTime MPEG-2 Playback Component. It is not possible to export the audio portion of a muxed MPEG-2 audio/video stream using QuickTime even if you have installed QuickTime MPEG-2 Playback Component. If you want to edit MPEG-2 in QuickTime5, 6 and 7 or QuickTime Pro, or you want to export the audio portion of MPEG 2 audio/video stream using QuickTime, or you want to play MPEG-2 not only in QuickTime but also in iTunes, iPod, iPhone, Front Row, iPad, Microsoft Media Player, BlackBerry, Android Phone and more, you can refer to Solution 2. Transcode MPEG-2 into MOV, MP4, WMV, and AVI in order to play MPEG-2 in QuickTime, iTunes, iPod, iPhone, Front Row, iPad, Microsoft Media Player, BlackBerry, Android Phone and more. 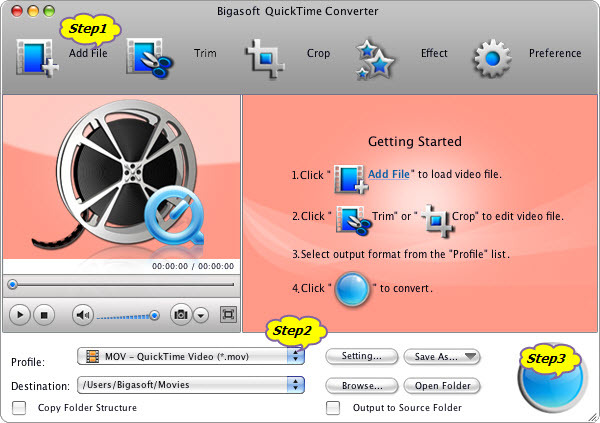 Bigasoft QuickTime Converter, the professional MPEG-2 to MOV converter, can easily convert MPEG-2 to QuickTime compatible MOV format without any loss of quality. In addition, the ideal MPEG-2 to MOV converter can also convert MPEG-2 to any other video format like WMV, AVI, MKV, MP4, FLV, then just enjoy MPEG-2 in QuickTime, iTunes, iPod, iPhone, Front Row, iPad, Microsoft Media Player, BlackBerry, Android Phone, YouTube and more. 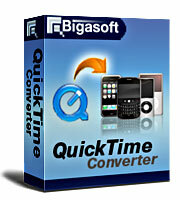 Free download Bigasoft QuickTime Converter (Windows Version , Mac Version ) install and run it. 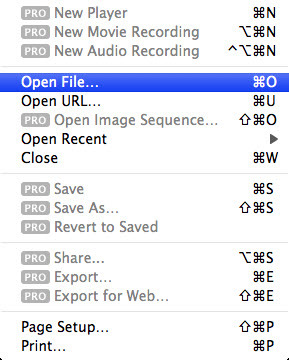 Click "Add File" button to add your MPEG-2 content which you want to play in QuickTime. Or simply drag and drop MPEG-2 content to Bigasoft QuickTime Converter-the professional MPEG-2 to QuickTime Converter. Hit the drop-down button on the right side of the "Profile"to select QuickTime compatible MOV format like MOV - QuickTime Video (*.mov) . Click "Start" button to convert MPEG-2 to QuickTime compatible MOV format. It will be finished soon. Run QuickTime, and then Hit "File -> Open File..." to upload the converted MPEG-2 to QuickTime. This solution will cost you $19.95, and it also provides free trial version. So you can download its free version to have a try first. With this professional MPEG-2 to MOV Converter, you can also convert MPEG-2 to MP4, WMV, AVI, MKV, and FLV etc so that you can play MPEG-2 in iTunes, iPod, iPhone, Front Row, iPad, Microsoft Media Player, BlackBerry, Android Phone and more. This method allows you to perform editing functions such as Cut, Copy, Paste, Add, and Add Scaled with MPEG-2 media using QuickTime Player, or you can even edit your MPEG-2 with this professional MPEG-2 to MOV Converter such as trimming, cropping and more. You can even export the audio portion of MPEG-2 audio/video stream using QuickTime, or you can extract audio from video with this profession MPEG-2 to MOV Converter. This method applies to all model of QuickTime including QuickTime5, 6 and 7 or QuickTime Pro and can work with PC as well as Mac, Just remember to download the right version: Mac version or Windows version of Bigasoft QuickTime Converter. Any of the above two solutions can assist you to play MPEG-2 in QuickTime. Solution 2 is more recommended, for it enables you play MPEG-2 not only in QuickTime but also in iTunes, iPod, iPhone, Front Row, iPad, Microsoft Media Player, BlackBerry, Android Phone and more such as advanced video editting functions.